Guitarists everywhere loved Flashback Delay. The sounds, the vibe, TonePrints, the entire package - it was a smash hit that rocked the world. But at TC Electronic, we’re more about moving things forward and listening to the feedback from the guitar community. And so, when wishes for things like presets and tap-tempo started rolling in, we listened. And boy, did we knock it out of the park. Think of your favorite delay sounds and chances are it’s a TC sound. Our delays are the industry standard and our 2290 Dynamic Digital delay is one of the most coveted pieces of gear out there today. We know and love delay and have made sure Flashback X4 delivers the legendary TC quality at every turn. We’ve also added 4 TonePrint slots that allow you to load 4 delay TonePrints - custom tuned tweaks of TC effects provided by your favourite guitarists! So from the awesome digital 2290 sounds to beautiful analog tape echoes, more exotic vibes of a reverse delay and even signature delay effects, Flashback X4 delivers every delay sound under the sun - past, present and future. Flashback X4 is so much more than the sum of three Flashback pedals. Sure, we do what we do to pay the bills, but at the core, we do this for the love of guitar. Our guitar team is dedicated to contributing to the guitar community because we are part of it! So, when feedback from Flashback Delay users started pouring in, we listened. So many guitarists out there wanted presets, and the ability to switch between delay sounds instantly. Using Flashback’s amazing sounds but switching between flavors made tons of sense to us, and so Flashback X4 caters to that wish perfectly with three presets that can be as different and varied as you need them to be. Dripping with the DNA of rock,TonePrints are free, custom tuned tweaks of your favorite pedals, provided by your favorite guitarists! TonePrints give you access to an effect as it is used by the artist of your choice - so you can tap directly into the TC tones used by rock royalty and turn your stompbox into the signature pedal of your favorite axe-slinger. 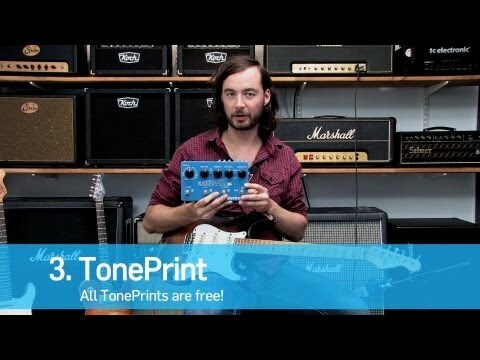 Use our free TonePrint Appfor iOS and Android to beam TonePrints to pedals instantly and wirelessly. You love tone, so do we, and Flashback Delay testifies to that. With optimized headroom, True Bypass or Buffered Bypass switching and Kill-Dry on/off, this pedal guarantees optimal tonal integrity and zero loss of tone. So whatever route you choose to go, we’ve got you covered. Plus no matter if the pedal is on or off, your precious dry sound is always passed through the pedal unharmed in all its pure analog glory due to an Analog-Dry-Through.